Garden incinerators & Fire Pits are proud to stock the fantastic Slate Effect Gas Fire Pit And Fire Bowl. With so many on offer right now, it is great to have a name you can recognise. The Slate Effect Gas Fire Pit And Fire Bowl is certainly that and will be a perfect buy. For this great price, the Slate Effect Gas Fire Pit And Fire Bowl comes highly respected and is a regular choice for many people. Callow Retail have included some great touches and this equals good value for money. 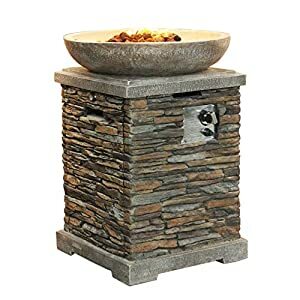 This elegant slate effect Fire Pit and Fire Bowl with look the part in any garden. The upright column is large enough to conceal a 20 lb propane gas canister inside (gas canister not included). The burner is made from Stainless Steel and the hose and regulator are all included. 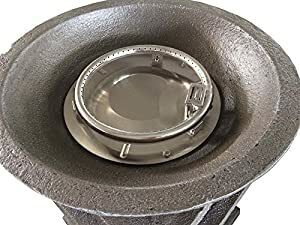 Unlike a wood burning fire pit there's no cleaning out ash and soot. Gas is cleaner, easier to light and keep lit, and creates a beautiful atmosphere. Also includes attractive lava rocks and a heavy duty PVC Vinyl cover. Simply hook up to a propane gas bottle and enjoy your stunning new Gas Fire Pit. 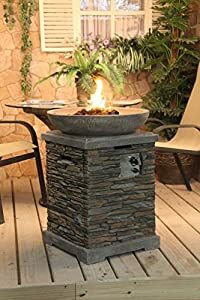 More than just a patio heater this fire pit will be the centre piece for all parties adding light, warmth and a great atmosphere to any social gathering. Measurements (L x W x H): 53 x 53 x 74 cm. Please note - this item is delivered via a pallet company and therefore will not be dispatched until we have made contact with you to agree a delivery date. Please ensure you provide a contact number for calling.